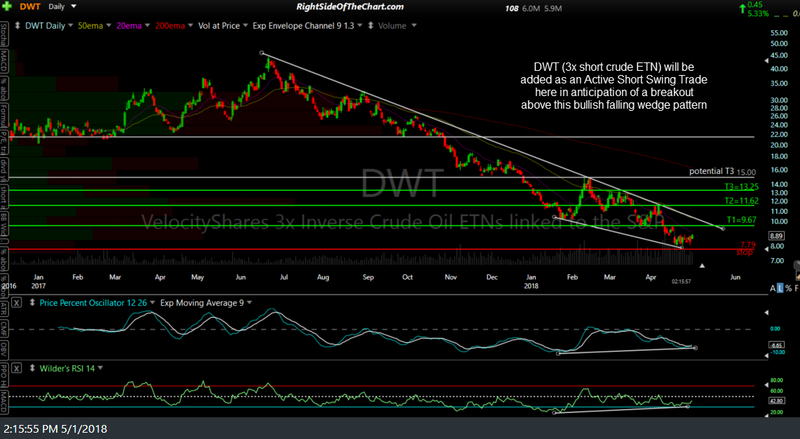 As a breakdown below the 67.00 support level on crude oil futures (/CL) appears imminent at this point, DWT (3x short crude ETN) will be added as an Active Short Swing Trade here in anticipation of a breakout above this bullish falling wedge pattern. As crude has been in a tight sideways consolidation range for the past two weeks, which often acts as a coiled spring building energy, my expectation is for a fairly undirectional move down in crude oil prices in the coming weeks+. As such, I’ve opted to use the 3x leverage DWT as the official proxy for this short on crude since the decay would be minimal or even non-existent, should that prove to be the case. Of course, even if this trade pans out, crude could slowly grind its way down to any of the price targets below with a lot of back & forth daily closes. Should that prove to be the case, one might be better off shorting USO (1x non-leverage long crude ETN) or crude futures vs. going long DWT. If so, price targets, as well as an initial support level which coincided with the first target on DWT, are listed on the chart above. The price targets for DWT are T1 at 9.67, T2 at 11.62 & T3 at 13.25 with the possibility of an additional target to be added around the 15.00 level, depending on how the charts of crude develop going forward. The suggested stop is any move below 7.80 (i.e.- any print of 7.79 or lower) with a suggested beta-adjusted position size of 0.35 to account for the 300% leverage & above average gain & loss potential on this trade. Note: Although DWT will be categorized as a Short Swing Trade, one would go long (buy) the ETN in order to gain short exposure to crude oil. Thank you so much for this analysis. 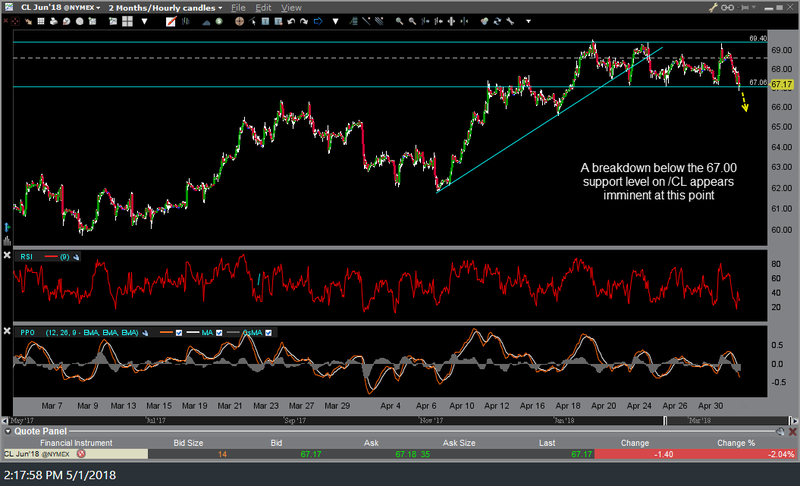 I added $DWT to my watch list just a day or two ago. I’m not Shorting in my trades at this time so I particularly interested in the DWT. 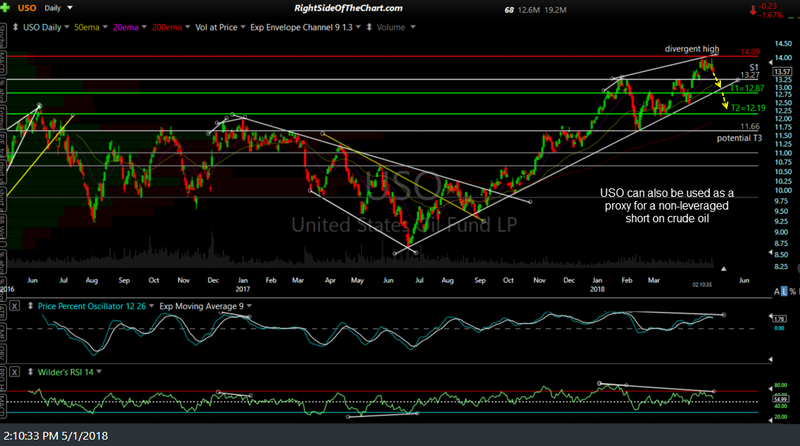 I saw it moving in a bit of a Higher Low pattern and today closed Green at $8.80. It tested $9.00 today too. Post Market I see an $8.85 but settling back at $8.80. I was kind of hoping for a Daily Open and Close at and above this $8.80 level to move higher than the most recent Resistance. On the other hand, my aggressive side says no time like the present as well. Which could very well be tomorrow at open for me. If not, certainly keeping an eye on it. There’s a decent chance that when all the crude oil proxies (/CL futures, USO, DWT, etc.) make an impulsive break above or below the recent trading range, including that 9ish resistance level on DWT, that we could get a pretty impulsive move. Crude inventories come out tomorrow morning at 10:30ET so let’s see if that’s the spark we need to break oil out of this range. Could go either way but the charts seem to indicate that even if the initial reaction to the inventory data tomorrow is bullish, any rally is likely to be faded soon with crude moving lower by next week.